Merry Christmas to you as well. Gorgeous calf/ santa. LOL ! How did you ever make that happen !! Merry Christmas ! It actually didn’t take as much persuasion as what I thought it would. The calves are very quiet. Yes, it did take more than one take! 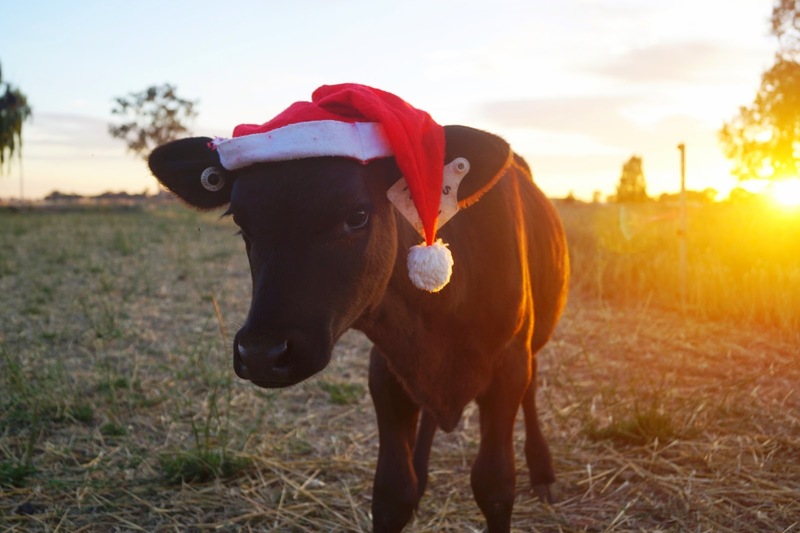 Nearly needed another santa hat too after the calves tried eating it. Fun photo! Hope you had a very Merry Christmas!! Oh Merry Christmas to you too! And from someone who lives in the USA in the Dairy State of Wisconsin, this photo is just perfect! So glad we have "met" this year through blogging! Thank you. Glad you liked it. I too have thoroughly enjoyed “meeting” you and will continue to tune into your blog and admire your extraordinary photos.